In Germany, drinking water supplies are plentiful and generally of a high quality. Drinking water is in Germany most commonly produced from groundwater (69.6 %), with a further 12.4 % being taken from lakes and dam reservoirs. The proportion of drinking water processed from bank filtration is about 7.8 %, with a further 9.2 % of drinking water being sourced from recharged groundwater. A mere 1 % is taken directly from river water . With bank filtration, wells are installed next to rivers for extracting water, some of which is supplied by the neighboring river itself through a process of infiltration. On its way to the well, the water flows through layers of sand and gravel. As the water flows along, almost all of the organic substances known to be present in rivers are, depending on their physical and chemical properties, either filtered out or biodegraded by microorganisms. Some substances are exceptional, however. They proceed along the filtration route unaffected and enter the raw water that is pumped out of the well near the river. Radiocontrast agents have an excellent chance of surviving the filtration route, since the demands placed on X-ray applications mean they need to exhibit good solubility in water and low biological degradability. Accordingly, these are incompletely biodegraded in waste water treatment plants or only converted into metabolites (intermediate products) and also survive bank filtration more or less “unharmed”. Yet radiocontrast agents are not the only reason that makes it essential to subject raw water sourced from bank filtrate to comprehensive treatment before pumping this water into the drinking water supply network. At most water works using bank filtrate as a source, this treatment involves ozonation followed by filtration through activated charcoal. Water companies often use radiocontrast agents as marker substances: if these agents make it past the activated charcoal filter, then it’s time to replace the filter. The anti-epileptic and psychotropic medication carbamazepine is another example of a substance that passes through bank filtration largely unaffected (up to 75 %) , but which is converted via ozonation into oxidation products that can be retained by using subsequent activated charcoal filtration. Fig. 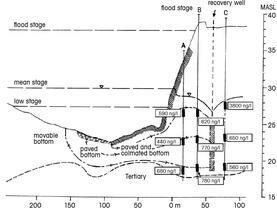 1 Cross-section through the Rhine (Lower Rhine section) at a site where bank filtration is used for drinking water production (DWT1). The raw water was pumped on October 17, 2012 from a gallery of recovery wells. Groundwater sampling sites are also available (A, B, C), at which water from a range of depths can be extracted for analysis. The concentrations of 1,4-dioxane measured (ng/l) are indicated in the boxes next to the sampling sites (extracted from ). In light of the protective measures mentioned in the treatment of raw water from bank filtration, drinking water plants encounter problems only if substances have good water solubility, poor biological degradability, missing oxidation by ozone and are poorly adsorbed by activated charcoal. Precisely this combination of adverse characteristics is exhibited by the class of compounds known as ethers. In the past, one ether has already proved very problematic for the water management sector: at the turn of the millennium, production of methyl-tert-butyl-ether (MTBE) – used as an additive (anti-knock agent) for gasoline fuels – was still running at around 500,000 t/year in Germany alone. After it was discovered in 2005 that this substance was present at concentrations of around 1 µg/l (and a peak concentration of 30 µg/l) in the river Rhine, the petroleum industry acted to replace MTBE almost entirely within a single year by another ether, ethyl ethyl-tert-butyl ether (ETBE). Regrettably, this was a case of “out of the frying pan, into the fire”, since ETBE is about as stable (persistent) in the aquatic environment as MTBE. Only the almost complete replacement of ETBE as a fuel additive by ethanol in the production of the petroleum products E5 and E10 (with 5 % and 10 % ethanol by volume) from 2010 onwards actually achieved the change so urgently needed. Unlike ethers, ethanol is readily biodegradable. The example of MTBE had already shown how it could pass unaffected through both the bank filtration and drinking water treatment processes to end up in drinking water . With MTBE and ETBE, the problem was not so much a toxicological issue but the fact that they have a very low taste and odor threshold of about 15 µg/l. Fig. 2 Concentrations of 1,4-dioxane (ng/l) in raw water from bank filtration at two locations on the Rhine, compared to concentrations in drinking water following treatment of the bank filtrate. 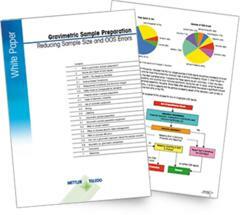 Samples were taken at DWT1 on December 10, 2012 and at DWT2 on March 22, 2013 (extracted from ). During the analysis of MTBE in water, a peak was noticed in the gas chromatogram and subsequently identified by its mass spectrum as 1,4-dioxane. Although 1,4-dioxane was an entirely unknown quantity in Europe at least until 2010, the substance had already been the subject of major environmental research in the USA, since it had been classified as a “probable human carcinogen” by the Environmental Protection Agency (EPA). From 2010, Daria Demers-Stepien, a member of Wilhelm Püttmann’s research group, therefore decided to devote a portion of her dissertation work to tracking down this substance. Initial analyses of water samples from the river Main revealed concentrations of around 1 µg/l – a very high level compared to other environmental pollutants. Similarly high concentrations in other rivers such as the Rhine or Oder were also discovered . In tracking down the substance, the first goal was to clarify its origins. 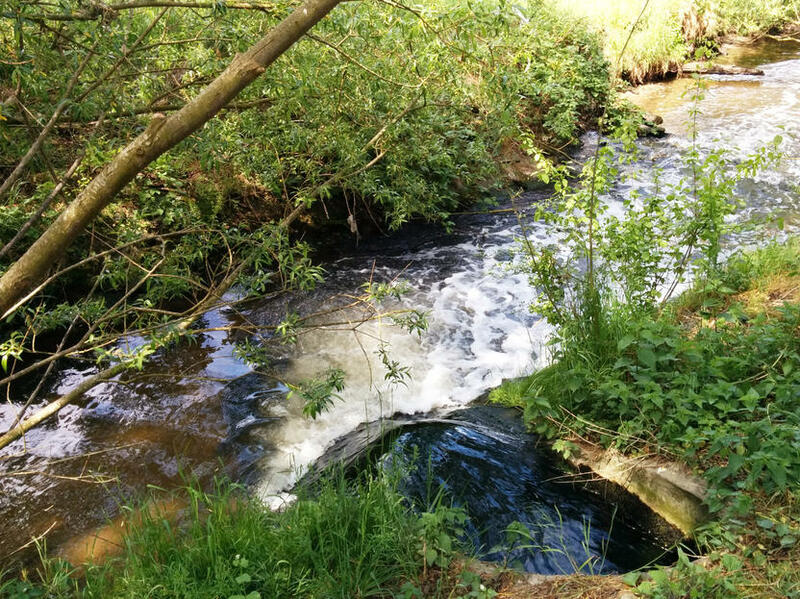 After a great many sampling fieldtrips, waste water treatment plant effluents were discovered to be the outstanding point source, occasionally showing very high dioxane loads. Where treatment plants only purify household waste water, concentrations of 1,4-dioxane in treatment plant effluents remain relatively low (approx. 0.3 µg/l). The source responsible for 1,4-dioxane here is the increased use of cleaning products and personal care products containing ethoxylates as an active ingredient in the detergent. Ethoxylates are primarily used in the manufacture of liquid detergents and cleaning agents. 1,4-Dioxane itself is created during the ethoxylate manufacturing process and cannot therefore be entirely eliminated. In light of this fact, the German Federal Health Agency in 1988 moved to recommend manu­facturers stay within a 10 mg/kg limit for 1,4-dioxane in cosmetics and personal care products. 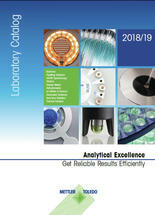 Compliance with this limit was confirmed by 98.6 % of 351 samples analyzed in 2011. The increased use of ethoxylates is unavoidably linked to our own lifestyle choices. The bar of soap on the washbasin has been largely replaced by liquid soap dispensers in the last 20 years. Accordingly, we are directly responsible for the background level of approx. 0.3 µg/l 1,4-dioxane found in domestic waste water treatment plant effluents. Yet the levels of 0.5 – 1 µg/l discovered in Germany’s major rivers cannot be explained by this value alone: contributions must also be being made by other sub­stantial point input sources. Locating these point sources is a task worthy of Sisyphus himself. By consulting results from several master’s dissertations, we can already conclude that a key role is played by “indirect dischargers”. Indirect dischargers are industrial and commercial businesses that do not operate their own waste water treatment plants but discharge their waste water into the municipal sewer network, where it is then treated at municipal waste water facilities. In Germany’s State of North Rhine-Westphalia, for example, the volumetric flow rate from industrial/commercial indirect dischargers is 771 million m3/year and thus over half the domestic waste water rate (1,314 million m3/year ). Comparable figures are unavailable for other German states or Germany as a whole. Firm conclusions cannot yet be drawn about which industrial sectors are, as indirect dischargers, the primary sources of 1,4-dioxane in the waste water network. Waste water treatment plants that receive indirect discharges from industrial enterprises involved in the manufacture or processing of ethoxylates from companies using 1,4-dioxane as solvent seem particularly relevant, however. The highest level recorded to date for 1,4-dioxane in waste water is 62 µg/l, and was measured at a treatment plant operating a “downstream denitrification” system. Denitrification lowers the nitrate content of effluent by converting the nitrate into mole­cular nitrogen, which is released to the atmosphere. This involves a final purification stage where microorganisms are fed a technical methanol which exhibited major contamination with 1,4-dioxane in the case investigated. While the microbes consumed the methanol as a carbon source, the 1,4-dioxane was still present at the end of the process . That having been said, downstream denitrification is used only by a handful of treatment plants in Germany and can therefore explain high levels in rivers in only a few isolated areas. The all-important question for our drinking water supplies is how the 1,4-dioxane detected in river water behaves when it undergoes bank filtration. One study investigated an area on the river Rhine (Lower Rhine region) where bank filtrate is used for drinking water production on a large scale. 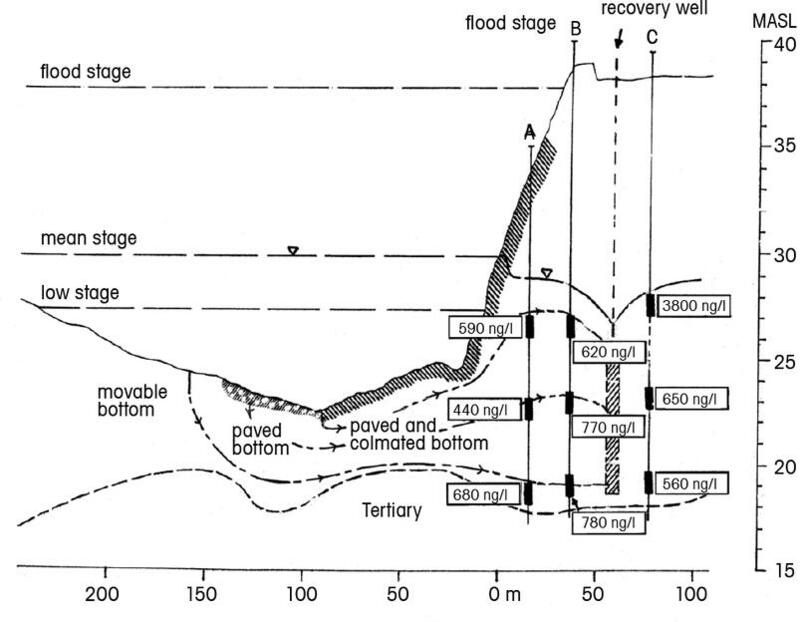 Figure 1 shows a cross-section through the extraction area while accounting for river water at a number of levels. Alongside the recovery well itself, other sampling points are available for research purposes, from which samples of water can be taken at different depths. The water pumped out at this site consists of about 75 % bank filtrate and about 25 % groundwater, which flows into wells from the bank side. The results show that high concentrations of 1,4-dioxane were recorded at all sampling sites in the monitoring wells, with values ranging from 440 ng/l (= 0.44 µg/l) to 3,800 ng/l (= 3.80 µg/l). The concentration in the Rhine itself was 0.78 µg/l at this point in time. The finding leads us to conclude that the entire aquifer surrounding the recovery well is almost homogeneously contaminated with 1,4-dioxane. One exception is the water from the ground-level sampling site in monitoring well C. The especially high concentration at this site (3.8 µg/l) can be explained if the groundwater flowing from the land side at this site is itself contaminated with 1,4-dioxane. This is plausible, since 1,4-dioxane has been added for a long time as a stabilizer to chlorinated solvents whose use has now been virtually eliminated (trichloroethylene and 1,1,1-trichloroethane) and groundwater contamination with chlorinated hydrocarbons is known at this location. One final issue to be answered concerned the capability of raw water treatment using ozonation and activated charcoal filtration to successfully remove 1,4-dioxane from raw water sourced from the recovery wells. This was investigated at locations of river bank filtration at the river Rhine. At the first site (DWT1), the raw water was ozonated, aerated and flushed through an activated charcoal filter. At the second site (DWT2), the raw water was ozonated and aerated before being flushed through a sand filter and an activated charcoal filter. The efficiency of these treatment processes is illustrated by Figure 2. 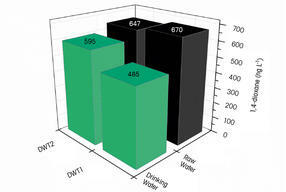 At the DWT1 site, treatment removed 16 % of the 1,4-dioxane from the raw water, while the figure was only 8 % at DWT2. As a consequence, the drinking water supplied by DWT1 and DWT2 had 1,4-dioxane levels of 0.485 µg/l and 0.595 µg/l, respectively. Considering its toxicological relevance, the authors urge the inclusion of threshold values for 1,4-dioxane in legislation governing the monitoring of drinking water. While treatment plants in Germany achieve outstanding results, some problematic substances are not degraded by the microorganisms in their systems and therefore pass through them unaffected. 1,4-Dioxane is one such substance. Even if treatment plants were to be retrofitted with new purification stages, a compound such as 1,4-dioxane remains intractable. The sole solution here is to prevent discharge into our sewage system which requires a better monitoring of indirect dischargers. In contrast to the USA, legal limits for 1,4-dioxane in drinking water have yet to be established in Germany. The Federal Environment Agency recommends a precautionary limit of 0.1 µg/l in drinking water for non-regulated substances, however. As results have shown, this value is occasionally significantly exceeded in Germany in regions where a high proportion of bank filtrate is used in drinking water production. That 1,4-dioxane is now a major focus for contaminant research is due in no small part to the dissertation of Dr. Daria Demers-Stepien, who received the 2014 Procter & Gamble Sustainability Prize for her work. First publication: Püttmann, W., q&more, 2.2015.